When I was first asked to appear as a guest panelists at the con by Natalie Buske Thomas, I was super excited. How perfect, with my book coming out! Then it dawned on me: How do you promote an ebook at a convention? All my Googling skills came up surprisingly short at finding out an answer to this question. This is where networking paid off. Thanks to indie published and painter Natalie, I’ve gotten some good ideas. Step one: Print. It turns out, it’s relatively cheap to print copies of a book on Createspace. I had no idea (so yes, I might be a smidge naive). In the past, printing a single copy of a book cost a ridiculous amount of money, and you only saved by buying in bulk. Createspace allows you to buy as many copies as you want for one price. (Not including shipping.) Works for me! Step two: Promo cards with QR codes. Oh, the future! Those more ebook inclined (like I am) can take away this card to look it up and buy the digital edition on their own time. Plus my cover will be floating around out there in the real world – that can only help, I gotta think! Step three: Posters. Why not? People love when they can have things signed. I don’t know if anyone will want me to sign anything (who the heck has heard of me? ), but if they do, I will have a sharpie standing by. Thanks for reading! 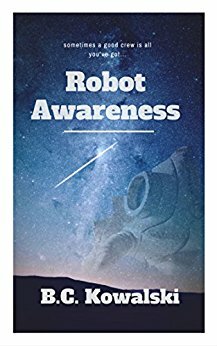 Look for Robot Awareness Part I coming out in May!